The Film: At the shrine of Onizuka, the gangster Kanzo and several of his men ambush two messengers. They are carrying a document that incriminates Kanzo in the death of his rival Nihei. An old man, the guardian of the shrine, warns the assassins that spilling blood there will bring a curse upon them. Regardless, both the messengers and the old man are killed. Miyo, the shrine guardian’s seven-year-old granddaughter, witnesses the events and picks up the dropped document. The gangsters spot her and give chase. She makes her way home, where her dying grandfather tells her what to do. She must journey along Tokaido Road to Hamamatsu. At the inn of Yui, she should find her long-lost father. When Miyo presents him with a special set of dice, he should recognize her as his daughter. Miyo’s journey is a dangerous one. Along the way, Kanzo’s goons pursue her. Luckily, she runs into one of Nihei’s men, Hyakutaro, a good-natured swordsman who protects her from harm. Kanzo’s men are also dogged by the curse of the yokai, who don’t appreciate the earlier bloodletting on sacred ground. When Miyo finally finds her father, they are both taken prisoner by Kanzo! Using the cursed dice, the crime boss makes the child wager her father’s life. Try as he might to rig the game, mere human treachery is no match for the power of the yokai! Will Kanzo’s final downfall come by Hyakutaro’s blade, or by the wrath of the angry spirits? 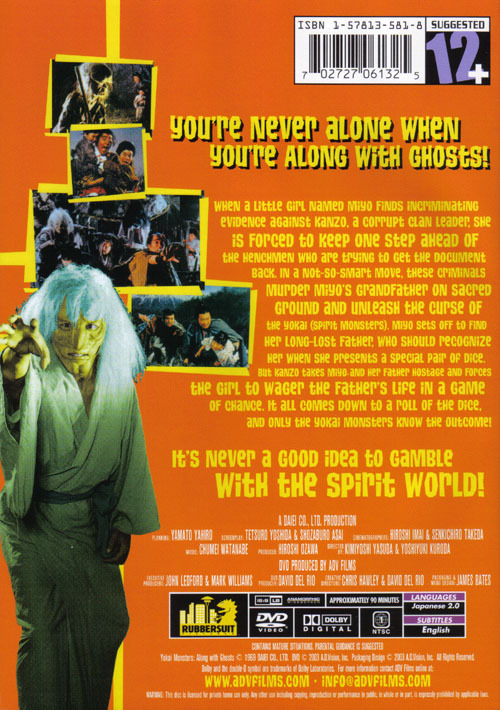 Along with Ghosts is the third Daiei yokai film (100 Monsters and Spook Warfare being the others). Disappointingly, this film features the least amount of monsters and supernatural intrigue of the three. It’s more like a samurai film than a ghost story or monster movie. The chases, swordplay, and yakuza double-crossing are only occasionally interrupted by otherworldly events. Not only do the yokai have the least amount of screen time in this film, those shown are generally less interesting. Some of the apparitions are cool-looking (like the bloody, floating severed heads), but none of them displays much personality. Extras / Menus: The extras are all trailers. 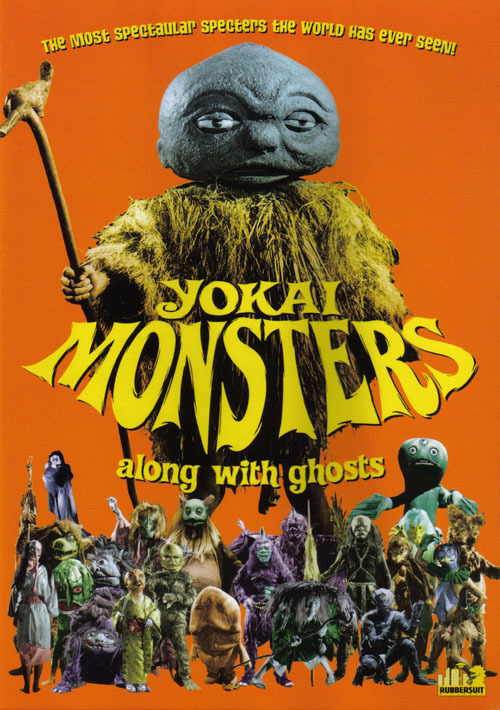 There are both the original Japanese theatrical trailer, and ADV’s U.S. trailer, for Yokai Monsters: Along with Ghosts. The Japanese trailer is presented in anamorphic widescreen, with optional English subtitles. Quality is good, though there is more print damage than in the feature itself. The ADV trailer is in non-anamorphic widescreen. Grouped separately under “Coming Attractions” are six ADV promo trailers. They are for: Yokai Monsters: Spook Warfare, Yokai Monsters: 100 Monsters, The Complete Daimajin Trilogy, Gamera: Guardian of the Universe, Gamera 2: Attack of Legion, and Gamera 3: Revenge of Iris. All are in non-anamorphic widescreen.